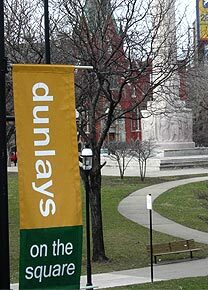 Dunlays on the Square (3137 W. Logan Boulevard) is holding a holiday food drive that’s a win-win proposition: Donate 10 food items of non-perishable canned and dry goods — think cereal, dried fruit, pasta, peanut butter, jam, beans, rice, mac & cheese, canned fruits, vegetables, meats, hearty soups — and get one of Dunlays’ famous chocolate chip skillet cookie desserts on the house. Want to increase the impact of your giving? Especially in this economy, it’s important to support local businesses like Sunrise Fresh Market on Milwaukee Avenue, so make an effort to shop local.